“I called for help, I didn’t call for you guys to kill him,” the sister is heard yelling in the witness video as she cries. In the video, taken by an unidentified witness and uploaded to YouTube, the sister says she called police three times asking for help for her brother. The distraught woman is heard saying she should have called the crisis communication team instead of the police. “Don’t you guys have crisis communication team to talk to somebody mentally sick?” she says. Police said they were called to the mall shortly after 2 p.m. by the sister of a man in his 30s who said he was “not acting like himself” and walking in traffic. Police also received other reports of a man acting erratically. They say the man refused “multiple” orders to take his hand from his pocket. He was shot and killed by police after pulling an object from his pocket, pointing it at officers and assuming a “shooting stance,” authorities said. 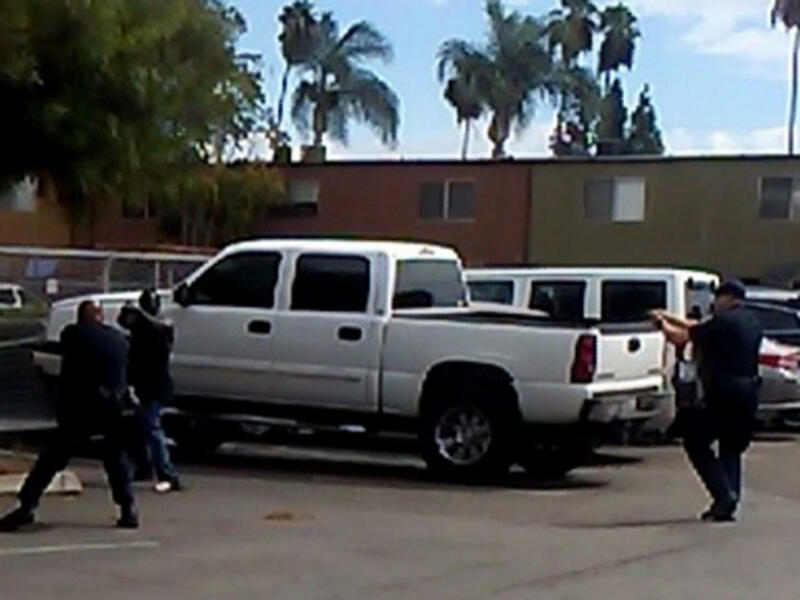 One of the officers tried and failed to subdue the unidentified man with a stun gun before the other officer fired several times, El Cajon Police Chief Jeff Davis said at a late night news conference. Davis would not say what the object was, but acknowledged it was not a weapon. Friends told the San Diego Union Tirbune he was mentally ill and had a mental breakdown that caused him to act out in the minutes leading up to the shooting. One man angrily told reporters the victim was suffering a seizure before the incident. A San Diego community website describes a “Psychiatric Emergency Response Team” that pairs mental health professionals with law enforcement officers in the field. “The PERT team evaluates the situation, assesses the individual’s mental health condition and needs, and, if appropriate, transports individual to a hospital or other treatment center, or referees him/her to a community-based resource or treatment facility,” the website says. According to the description, the team serves all areas in San Diego county, including the El Cajon Police Department. An El Cajon Police spokesman didn’t respond Wednesday to Crimesider’s inquiry about whether the team was called. On Wednesday, protesters again gathered, this time outside the police station. They called on police to release the full video and 911 calls, and demanded an independent investigation. The Rev. Shane Harris said the man’s sister had called 911 and made clear to dispatchers he had mental issues. “There were real issues with his mental health and that was part of the conversation,” Harris said in an interview with the AP. Meantime, other videos quickly surfaced showing the aftermath. In the witness video posted to YouTube, an unidentified woman is heard telling police at the scene that the man was ordered to take his hand out of his pocket. Another woman is heard saying the police weren’t giving information to the sister about her brother’s condition.